The conversation about the importance of antifouling measures is growing. Here are five reasons why shipowners and operators should not ignore the debate and should opt for quality marine coatings. It’s a tried and true business cliche´: the market is getting tougher, more competitive. In the global supply and demand game, marine coatings companies are competing intensely to capture more market shares. Shipowners and operators want their vessels to operate faster, cheaper and greener. In addition, the companies that supply the raw materials to the coatings market are pushing for higher prices to meet their own increasing costs. The driving force behind this market pressure is, in part, the regulations that dictate an increasing level of environmental performance from the coatings themselves and the vessels that use them. For the major coating companies, like Jotun, it is about responding to customer and market needs in a professional and responsible manner that benefits all stakeholders. Currently, boicide-based self-polishing coatings are widely applied as standard defence against fouling. Performance and price of these antifouling coatings varies largely depending on base matrix and antifoulings used. 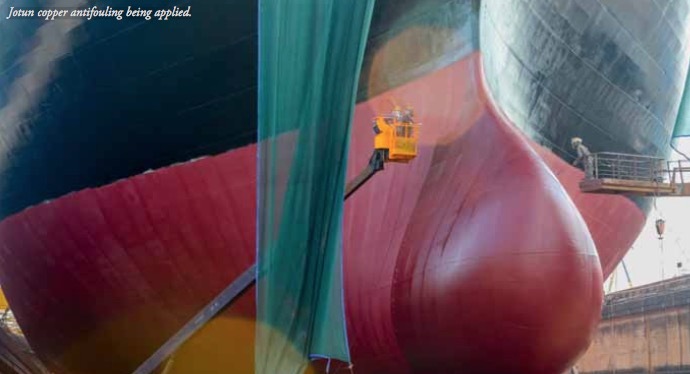 So, what can shipowners and operators achieve by using advanced antifoulings? Comply with environmental regulations: ship operators must comply with the accumulating environmental legislation and regulations. For instance, IMO has agreed to maintain the implementation of the 0.5% global sulphur cap by 1 January 2020. Also, EU MRV (Monitoring, Reporting and Verification) comes into force 1 January 2018. Jotun has invested heavily in research and development to create reliable high- performance products to meet the increased focus on this segment. This is backed up by tighter control of all of the supporting roles including global production, service and technical advice.